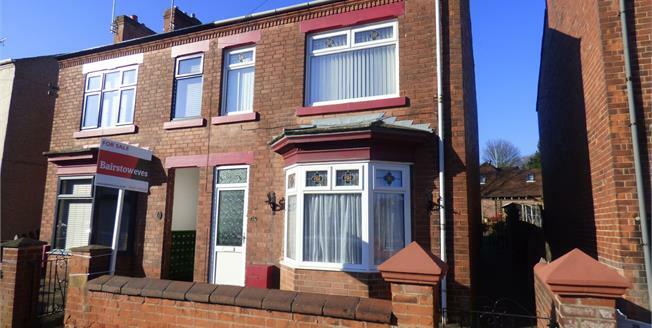 SPACIOUS TRADITIONAL THREE BEDROOM SEMI! Bairstow Eves are delighted to welcome to the market this fantastic opportunity for families, first time buyers and investors to acquire this deceivingly spacious three bedroom semi detached family home which is to be sold with no upward chain. The property comprises of a spacious entrance hall that gives access to a bay fronted living room with feature fire place as well as the second reception room with access to the fitted kitchen. The kitchen then also leads into an inner hall where a shower room and separate w/c can be found. The first floor benefits from a huge master bedroom to the front of the property, a second double bedroom and a fantastic sized third bedroom. Additionally the property has gas central heating, double glazed windows throughout and a gorgeous enclosed rear garden. Situated in the heart of Mansfield Woodhouse and within walking distance to an array of local amenities and schools. This property is a must view to appreciate what is on offer so please call the office for viewing arrangements. Double glazed uPVC bay window facing the front. Radiator and gas fire, carpeted flooring, ceiling light. Double glazed uPVC window facing the rear overlooking the garden. Radiator and gas fire, carpeted flooring, ceiling light. Double glazed uPVC window facing the side. Vinyl flooring, ceiling light. Roll top work surface, fitted, wall and base and drawer units, stainless steel sink, space for, electric oven, space for, gas hob, over hob extractor, space for fridge/freezer. Double glazed uPVC window with frosted glass facing the rear. Radiator, carpeted flooring, ceiling light. Double glazed uPVC window with frosted glass facing the side. Radiator, vinyl flooring, ceiling light. Low level WC, roll top bath, pedestal sink.